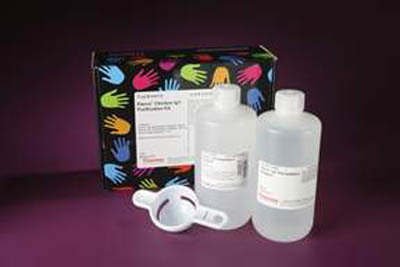 Purify chicken antibodies from hen egg yolks with a unique delipidation reagent and precipitation reagent to selectively isolate the IgY fraction. The IgY Purification Kit is simple and easy to use. After isolating a yolk using the supplied egg separator, lipids are effectively removed by incubation and centrifugation in Pierce Delipidation Reagent. This first reagent is also effective as a storage solution, enabling multiple yolks to be collected and stored for simultaneous extraction at a later date. Upon addition of the specialized Pierce IgY Precipitation Reagent and subsequent centrifugation, a nearly pure pellet of intact IgY results; it is easily dissolved in phosphate buffered saline (PBS) or other storage buffer. The purified IgY is ready for use in immunodetection methods or antigen-specific purification without interference from lipids.